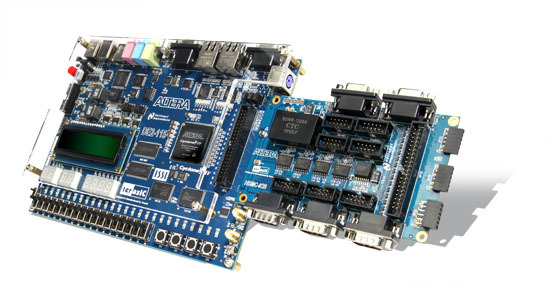 The Industrial Networking Kit (INK) offers a comprehensive development platform for industrial communications and automation applications. The kit consists of the DE2-115 board featuring the Altera Cyclone® IV device and an Industrial Communications Board (ICB-HSMC) that supports RS-485, RS-232, CAN, and additional I/O expansion. The INK gives industrial equipment designers greater flexibility in implementing real-time Ethernet communications with the availability of Industrial Ethernet IP cores.